Rocky was born in Kadina, South Australia in 1932 and the family moved to Wallaroo. While at school Rocky was a volunteer to all-travelling concert shows and circuses that came to the area, in the hope of a complimentary ticket. In 1939 his mother remarried and moved to Crafers in the Adelaide Hills where he completed school. Stepfather George Westly was a talented musician playing button accordian and mouth organ. He taught Rocky to play the instruments. 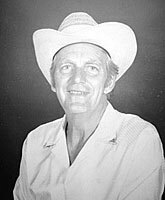 Wilf Carter, Tex Morton and the Carter family were being played on radio request shows at the time, which greatly influenced Rocky. At this time Rocky was introduced to hypnosis (age 10) he spent many years studying the mind. Although hypnosis was frowned upon he presented hypnosis in most theatres around Australia. Rocky’s first job was delivering meat and mail around the Adelaide Hills on horseback. In the early 40s Rocky met radio personality Uncle Bert Wooley, who gave him a guitar and taught him to play. In the late 40s Rocky appeared on Radio 5DN, 5AD, Tivoli Theatre and Good Friday appeals. 1951 Moved to Berri, he continued teaching in all Riveland towns for the Adelaide College of Music. All Riverland charities greatly benefiteed by the ‘Rocky Page School of Music’. 1957 Rocky met Les Partell, they had many joint ventures in show business, creating duo ‘Whitman Bros’. Rocky made appearances on Melbourne TV stations 9 & 7 and Radio 3DB. The Rocky Page Show played to packed houses in Melbourne and Victoria country. Touring with him was Ian Castles, Tex Banes, Isobel Denmead and Ken Warne. With the cold weather in Melbourne Rocky suffered from Brochitis and pneumonia, he moved back to the warmer weather in the Riverland opening a music shop and music school in Berri. 1961 A two month tour in Tasmania with Slim Dusty show. Recorded with Hadley in Launceston with Slim Dusty, Joy McKean and Barry Thornton backing. 1961-67 The next 6 years worked for Frank Foster at capital city showgrounds with Lonnie Lee, Slim Dusty, Chad Morgan, Lionel Long, Johnny Chester, Johnny Devlin, Johnny O’Keefe and Normie Rowe.